Sometimes you obtain items that you really don’t have any ideas for. Paper stacks are often like this for me. The print poetry stack in the Spring catalog has beautiful patterns featuring the current In-Colors, both masculine and feminine. 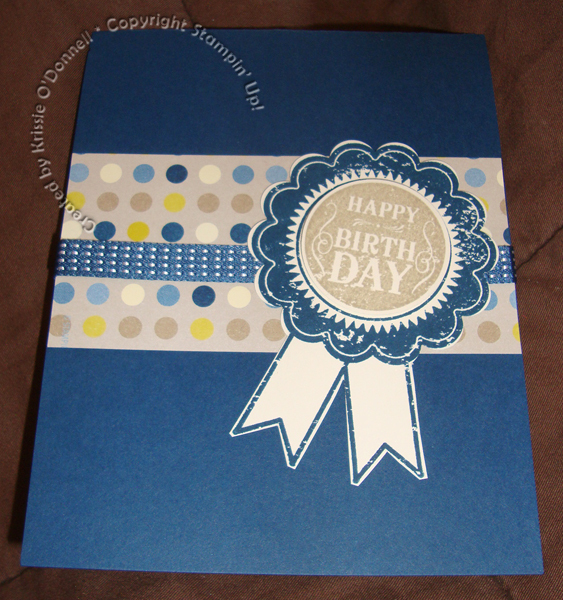 I often have a hard time thinking up masculine cards, and really its what I need most, I have so many men in my life… The Blue Ribbon stamp set is new to me, and I found a great way to punch out the scallop part of it from Patty Bennett’s blog, so I went for it. It doesn’t punch out super perfectly but much better than having to cut by hand! The secret is, just cut around the outside of the bottom ribbons, then place the stamped image into your punch with the tails hanging out the top. Its a bit tough to line up still as you’re using limited space, but it gets the job done as long as you’re careful. I did find myself wishing I’d used colored cardstock to stamp on rather than Very Vanilla, but that is something I can give my stampers the option of changing up this weekend when we make this card at our stamp camp! ← You are Loved – Thank you!